Stream flow (also called discharge) can be defined as the volume of water passing a set point in a given period of time. The drainage area and land uses surrounding a stream can have a significant impact on stream flow. 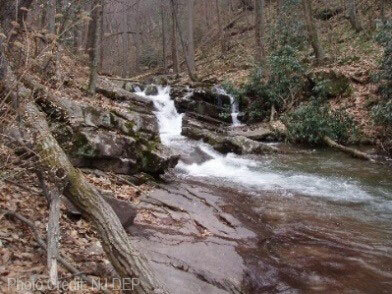 Small mountain streams respond quickly to rain events; rising fast, but then returning to normal flow conditions quickly. Larger streams have a longer lag time due to the large drainage area and tend to rise and fall slowly. The amount of impervious cover (parking lots, houses, etc.) from development can also influence how the flow of a stream responds to rain events. 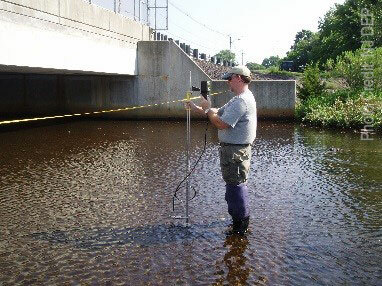 Stream flow measurements play an important role during periods of flooding when the expected �crests� of streams are closely monitored. 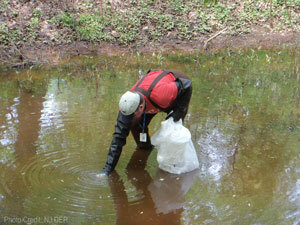 However, flow measurements also play a role in assessing water quality issues. 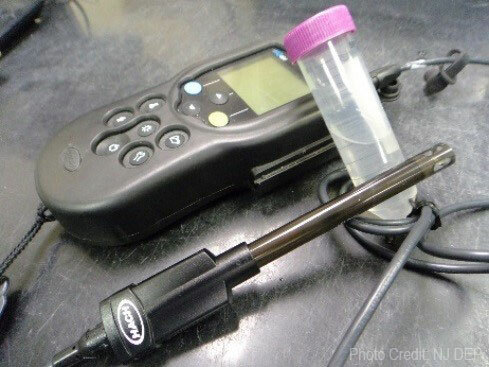 Water samples from a stream can be sent to a lab to determine the concentration of a pollutant (the amount of pollution within a defined volume of water), but when used with a flow measurement the load of a pollutant can be calculated to determine how much of a pollutant is discharged from a stream over a period of time. 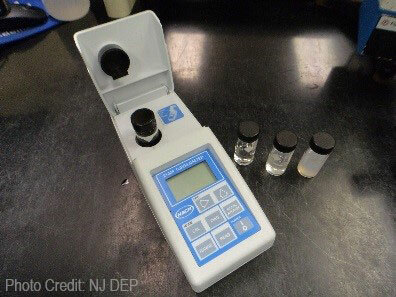 These measurements are used to determine daily loads of a specific pollutant and can be used to develop a Total Maximum Daily Load requirement for a stretch of stream with the goal of improving stream water quality. Measuring flow can also provide insight on seasonal trends and how a stream responds to rain events. Obtaining flow measurements are done by different methods. Many water quality sampling sites on larger streams are co-located with stream gages maintained by the United States Geological Survey, which provide real-time discharge measurements. 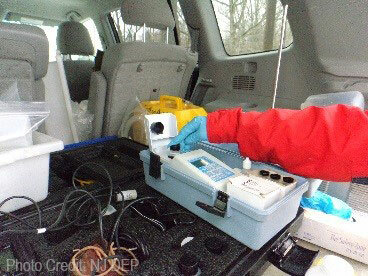 At sites without a gaging station, the Bureau uses an acoustic Doppler current profiles. Using the principle of the Doppler effect, a beam measures the change in frequency from sediment in the water flowing by to measure velocity. Typically in wadable streams, a cross section of a stream channel is divided into sub-sections where the area is calculated by the measured width and depth. This is then used to calculate a flow measurement with the given velocity. The velocities from each sub-section are then added up to calculate an overall flow. Flow is typically measured in cubic feet per second. 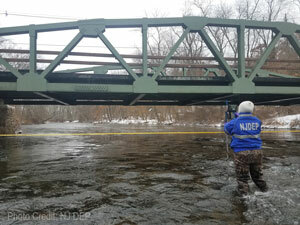 The Bureau has also developed the capability to collect measurements at non-wadable streams. 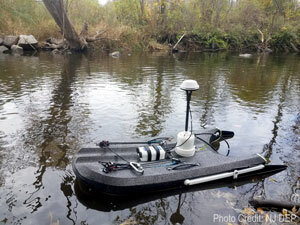 This involves using a boat mounted acoustic doppler current profiler which takes continuous measurements of water velocity as it is moved across the stream. To learn more about the procedures used by the Bureau, an in-depth training course by the United States Geological Survey can be found here. 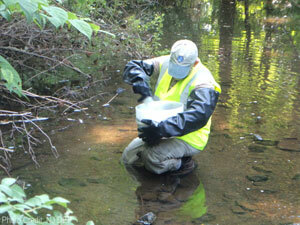 For every sampling event at a stream, on-site measurements of physical and chemical parameters are taken. 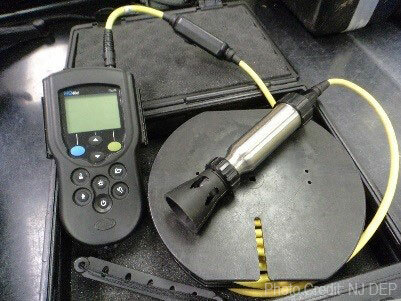 Many parameters such as pH and dissolved oxygen need to be measured on site since they are affected by water temperature or other factors. Daily calibrations of meters and multiple measurements help ensure both precision and accuracy of these field readings. Standards (known concentrations) are used to calibrate and perform checks on meters before any sampling event. Click below to learn more about the meters and probes used by Bureau staff and the parameters they measure. Turbidimeter: Measures the clarity of the water, which is related to the ability of light to penetrate. The more light scattered by sediment and other materials in the water, the higher the turbidity. Higher turbidity results in a decreased opportunity for photosynthesis and lower dissolved oxygen levels. High turbidity in a stream can indicate issues with runoff and erosion, which result in increased sedimentation. Too much sedimentation can destroy habitat for aquatic life by burying important spawning areas or smothering biological communities. 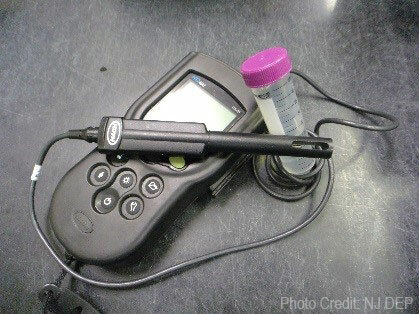 Conductivity probe: Measures specific conductance, which is the ability of water to conduct electrical current. Specific conductance is based on the relative amount of ions dissolved in water. A large seasonal contributor to a conductivity reading is salt used for treating highways and roads during the winter months. That salt, usually composed of chloride and sodium or magnesium, gets washed into nearby streams during rain events and periods of melting snow. High conductivity can indicate high concentrations of ions, some of which are detrimental to aquatic life. Dissolved oxygen probe: Measures dissolved oxygen concentration and percent saturation as well as barometric pressure and water temperature. Since dissolved oxygen is inversely related to temperature, it is important to measure water temperature and barometric pressure concurrently. 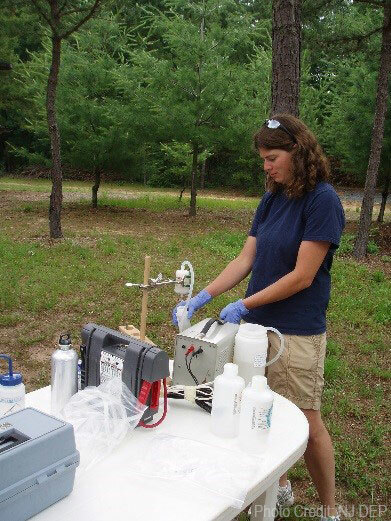 Adequate dissolved oxygen is essential for a healthy aquatic biological community. 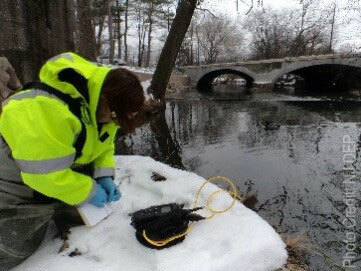 Low dissolved oxygen levels may be an indicator of excessive biological activity related to the decomposition of organic material, but also may be a natural condition related to certain types of waterbodies (i.e. wetlands typically exhibit lower dissolved oxygen levels than free-flowing streams). pH probe: Measured on a scale of 0 to 14, this probe measures the pH of a stream, whether it is acidic (values less than 7) or basic/alkaline (values greater than 7). 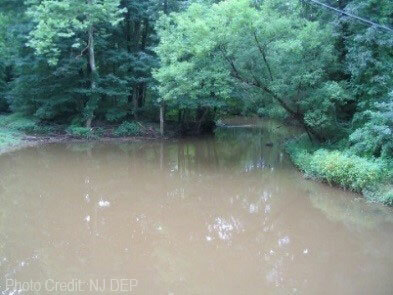 The acidity of New Jersey streams can vary greatly depending on the underlying geology. For example, streams in and near the Pine Barrens are naturally acidic (typically with pH of 3.5 to 5.5); a byproduct of the sandy acidic soil in the region, while most streams in northern New Jersey are more alkaline (pH of 6.5 � 8.5) due to the local geology and soils found there. The pH value affects aquatic life directly (certain fish and other aquatic life cannot survive in streams with pH values which are too low or too high) and the availability of certain chemicals and nutrients. 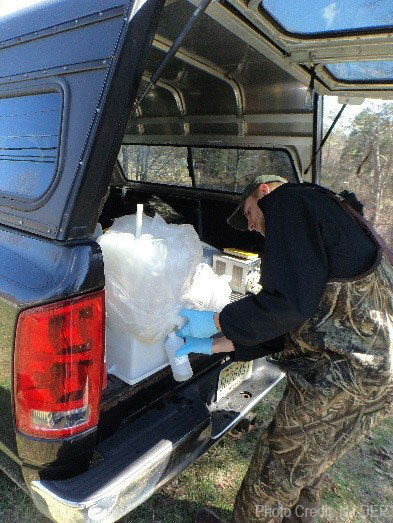 To properly characterize the chemical and physical parameters of a stream, sample collection is not always as simple as dipping a single bottle in the stream. Rather, a composite sample that incorporates the entire width of a stream as well as the vertical profile may be essential to collecting data representative of the stream�s water quality. 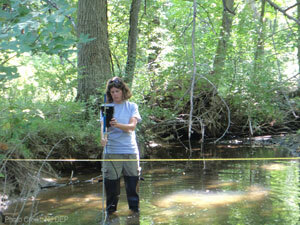 In this process, a stream is divided into sub-sections along a transect and samples are taken in each sub-section. Water is collected in a churn splitter which is used to create subsamples that is representative of the overall stream. (1) total (non-filtered) samples that contain suspended materials from the water column. Certain constituents can adhere to or be transported by suspended sediment and/or particulates. (2) dissolved (or filtered) samples, that have had particulates removed. Dissolved components tend to be more biologically available and mobile and thus are more susceptible to uptake by fish and other aquatic organisms. 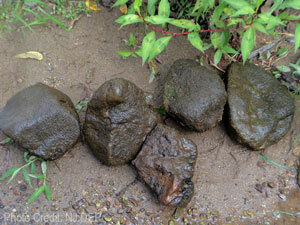 During the summer months, rocks in a stream bed often develop a slippery brown or green film on their surface. This slime is actually a mixture of algae, cyanobacteria, fungi, diatoms, plant detritus, etc. that live on the submerged substrate of stream beds known as periphyton. Often the dominant algae attached to these rocks and other substrates are diatoms, an abundant group of microscopic algae distinguished by their silica-lined cell walls. Similar to fish and macroinvertebrates, Diatoms can be used as a bio-indicator for environmental monitoring. They are abundant in streams and quickly respond to changes in water quality. They also vary in tolerance levels of pollutants in streams. Diatoms have been the focus of sampling for investigating water quality issues. 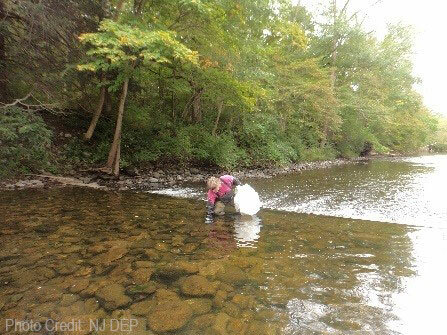 In the past, sampling has been conducted to study nutrient impacts on the health of diatom communities. 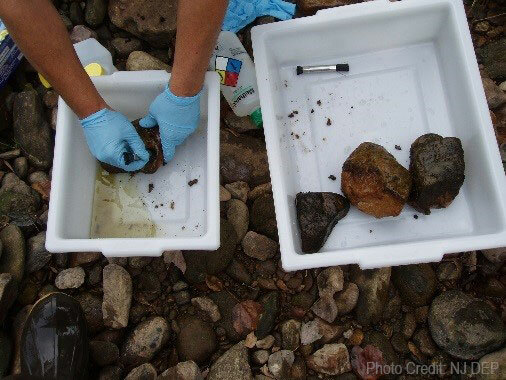 As part of the cooperative Ambient Surface Water Quality Monitoring Network with USGS and sometimes for special projects, the Bureau obtains samples of streambed sediment at a subset of sites. 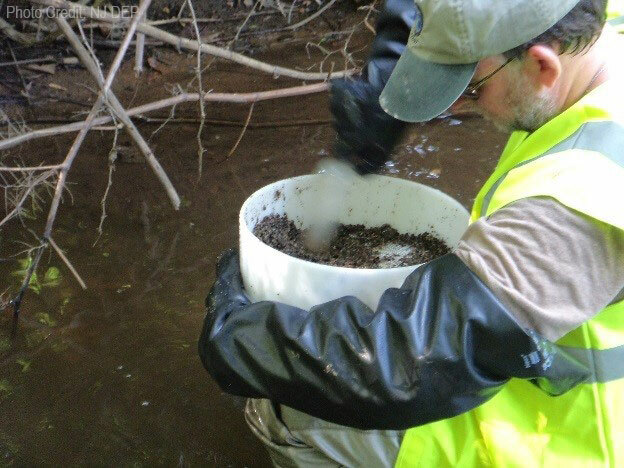 Analyzing streambed sediment for contaminants adds valuable insight into determining the overall water quality of a stream. Fine sediment such as clay and sand accumulate pollutants as they attach to the particles, often producing higher concentrations that may not be shown in water-column samples. 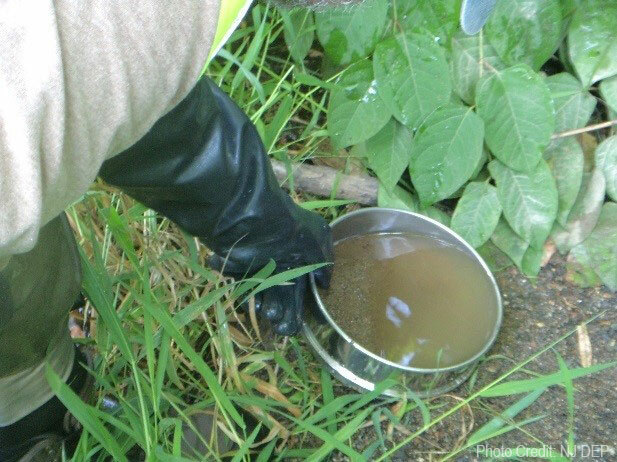 Additionally, many contaminants may come from runoff during rain events and, therefore, may not be captured by routine discrete water sampling, especially during normal-flow conditions. Only the top 1-2 inches of bed material are collected to obtain samples of most recently deposited material. Sediment is passed through a plastic sieve and/or metal sieve (depending on the contaminants being tested) to collect only fine particles of a specified grain size. Sediment is taken from multiple depositional environments within the stream from which a composite sample is produced.